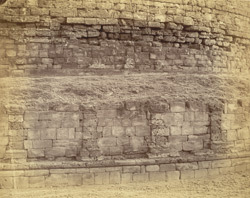 Photograph of the masonry at the base of the Great Stupa, Manikiala, Rawalpindi District in Pakistan, part of the Archaeological Survey of India Collections: Indian Museum Series, taken by Joseph David Beglar in the 1870s. The remains of the great stupa at Manikiala was excavated by General Court in 1834 and is dated to the Kushana period, 1st-2nd century A.D. It is believed to have once housed body relics of the Buddha. Alexander Cunningham wrote in the Archaeological Survey of India Report for the Year 1872-3 (Vol V): "The great tope of Manikyala is a hemisphere 127 feet 9 inches in diameter, resting on a cylindrical neck, 15 feet in height. This is surrounded by a raised terrace 18¾ feet in breadth, and 13 feet 4¾ inches in height. The total height of the dome, as it now stands, is therefore 92 feet 3¼ inches...The great mass of the tope is built of huge rough blocks of sandstone inside, with a carefully-smoothed facing of kankar outside the dome, and of sandstone in the spaces between the pilasters, both of the cylindrical neck and of the terrace plinth."